Terms and conditions: OK, this is the boring but important legal stuff. Please keep a note of the following terms and conditions of Arrow Valley Hog Roast. All bookings are provisional up until the receipt of your 20% deposit. Deposits are non-refundable if you decide to cancel. If the date of your function switches then we’ll do our very best to accommodate the new date but with no obligation. The 80% outstanding balance will be due two weeks prior to the event. We have the right to cancel the booking if the full amount is not forthcoming 3 days prior to the date. The outstanding balance of our fee is payable either by cash or by a cheque to be paid (five working days) before your event. Final numbers and other details will need to be confirmed seven days prior to the event. This will include guest numbers, serving times and any other special instructions. We only use CE approved hog roast catering machines and equipment, which are specifically manufactured to the highest quality. They give faultless cooking results time after time. Safety – Equipment is regularly checked for safety. Electrical equipment is PAT tested. You’re responsible for providing clear access with a well lit clear path to and from the catering or gazebo areas. Any special allergies must be told to us by email prior to your event. This will ensure that any special dietary requirements are stuck to in respect of food preparation. Any guests with special pre-arranged dietary requirement should make themselves known to the chef or supervisor on the day of your event or time of the hog roast. 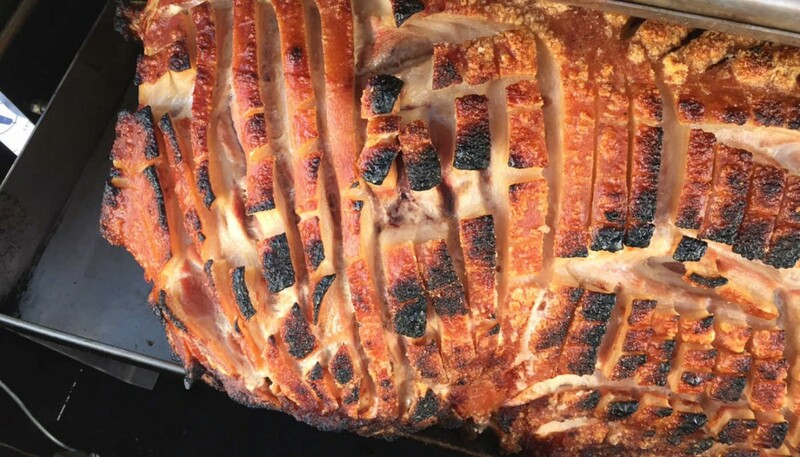 70 guests or less will be supplied a whole side of mature pork which time and time again has provided enough ‘cover’ to potentially produce outstanding crackling. Small ‘weaners’ don’t normally have enough cover to produce good crackling. There’s a solution to ‘upgrade’ to a whole pig which has enough ‘cover’ for a small extra meat cost. Cooking times vary from three and a half hours upwards. Your quote includes a fixed rate cost to deliver, operate or collect within a 25 mile zone from Redditch Town Centre. However, we’re more than willing to travel further afield but a small surcharge would be added based on mileage covered. Meat in a bun is supplied with 4” – 5” (100mm – 125mm) floured baps which are sourced from a variety of local sources. We aim to provide pedigree free range pork which has been traditionally reared and ethically produced. We cannot accept liability or pay compensation where the “performance or prompt performance of our contractual obligations is prevented or affected by circumstances amounting to “force majeure”. Such events may include but are not limited to war or threat of war, riots, civil strife, terrorist activity, industrial action, natural or nuclear activity, road traffic accidents, wet or windy weather conditions, fire and all similar events outside our control”. A reduction in guest numbers or service that has been pre booked or ordered may not reduced more than 5% of the total cost up to 2 weeks before the event. No reduction in service or guest numbers can be accepted within the two week period, prior to the date of the event. When a “Contract Price” has been offered and openly accepted then a subsequent variation in guest numbers may render that contract price Null and Void. An updated quantity or menu will automatically default to the a new quote at the time of change. The deposits are received to book catering staff, allocate hog roast equipment, advance order produce for your event, and administration. Booking your event in our calendar crosses out our availability to other clients and therefore a deposit is not refundable. You’re liable for any damage by misuse and/or theft while the hog roast equipment is in your possession. We recommend that you ensure that you have adequate insurance protection for the equipment to the value of £3,000. Never leave the hog roast while it is switched on. It must be supervised at all times by responsible adults. Children must be kept away from the equipment during the cooking process at all times. All surfaces on the oven become extremely hot. 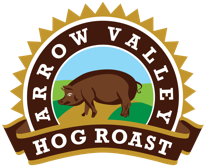 Arrow Valley Hog Roast accepts no responsibility for any injury to persons or damage to property incurred while hiring or otherwise using or handling the equipment, however caused. Collection of the roaster will be by 10 am the following day.